When I'm on the road, as I frequently am... too frequently as of late, I really do need to stay connected. With the proliferation of free WiFi, you have plenty of access, but open unsecured wireless brings about a lot of security issues that I don't want to deal with. That's why, for the past several years, I've owned and used my own portable WiFi hotspot. My Sprint Sierra Passport has served me well for these past years and I use it frequently. 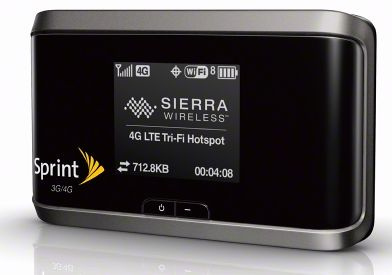 Now, comes word that Sprint is about to go to the next step in portable wireless hotspot access. Here are the details from an article on Foxnews.com If you'd like to read the article on Fox, click here. After launching its WiMAX 4G network back in 2010, Sprint is now opting to shift its weight toward LTE, a new 4G standard pioneered by Verizon in 2011. With Sprint's new hotspot, you don't need to worry if you're traveling to a city that doesn't yet have a 4G LTE network — or even a 4G network at all. The device can flit between 4G flavors and even hook into 3G, taking the guesswork out of the entire process. Sprint's LTE network won't be rolling out until this summer, but that isn't stopping the carrier from readying its hardware arsenal now: The Tri-Fi hotspot, manufactured by Sierra Wireless like Sprint's Overdrive 4G hotspot, will go on sale for $99.99 with a 2-year contract (and a $50 rebate) on May 18. If being away from the web gives you separation anxiety, a cleverly signal-agnostic tool like the Tri-Fi might be just what the doctor ordered — but those hotspot data overage fees can still kill you if you aren't careful. This story originally appeared on Tecca.